Light is a source of energy. Without light, we will not be able to see anything. It is only because of the phenomena of reflection and refraction that we are able to view objects. The ultimate source of light on the earth is the Sun. Optics refers to the study of the light; and also the study of the interaction of light. Light waves are electromagnetic waves; they are transverse in their nature. The speed of light in the vacuum is exactly 299,792,458 m/s. The frequency of the light remains unchanged; however, its speed and wavelength vary, depending upon the medium through which it passes. Luminous Objects: Luminous objects are those which emit their own light; for example, the sun, other stars, etc. Non-Luminous Objects: Non-luminous objects are those which do not emit their own light. They become visible only because of the reflection of light falling on them; for example, table, board, car, etc. Ray of Light: A ray of light is a straight line drawn to distinguish the path of the propagation of light. A beam of Light: A beam of light is defined as the bundle of closely packed rays of light. Real Image: A real image forms when the light rays focus at the image position. It is located in the plane of convergence. Also, it is possible to make a real image on a screen, like a sheet of paper. Virtual Image: A virtual image forms where the light rays do not actually meet but appear to meet. The change in the direction/path of light when it strikes an object and bounces back from the surface of the object is called reflection. The surface of the object can either absorb or reflect the light which strikes it. The rays of light falling/striking a polished surface, like a mirror, are reflected back. A boundary refers to the margin for the transition of the medium. Incident Ray: The ray of light which strikes the surface of an object. Reflected Ray: The ray of light which is reflected back/bounced back the moment it strikes the surface of an object. Normal Line: An imaginary line which is perpendicular to the boundary or the surface of an object. Once the ray of light strikes a surface of an object, it forms an angle of incidence and the angle of reflection. The Angle of Incidence (θi): The angle which the incident ray forms with the normal line at the point of incidence. The Angle of Reflection (θreflection): The angle which the reflected ray forms with the normal at the point where the reflected ray bounces back. Regular Reflection: A regular reflection occurs when the reflecting surface is very smooth. When a parallel beam of incident rays strike a smooth surface, a parallel beam of reflected rays is obtained. The objects are clearly visible and distinguishable in the reflected image. Diffused/Irregular Reflection: An irregular reflection occurs when the reflecting surface is rough. When a beam of incident rays strikes a rough surface, a non-parallel beam of reflected rays is obtained. The angle of incidence is always equal to the angle of reflection. Both the angle of incidence and the angle of reflection are measured from the normal line; θi =θreflection. The incident ray, the normal, and the reflected ray- all lie in the same plane. The incident ray, as well as the reflected ray, are on the opposite sides of the normal line. The laws of reflection are applicable to all reflecting surfaces like polished surfaces, plane surfaces (mirrors), and curved surfaces (spherical mirrors). 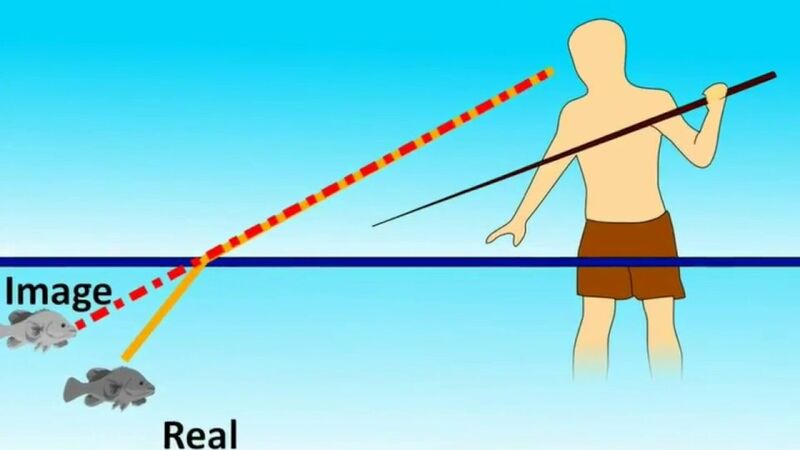 Calculation of the angle of incidence and the angle of reflection: The angle of incidence and the angle of reflection are calculated by just drawing a line, called normal line, perpendicular to the surface of the object. The incident ray, the normal, and the refracted ray- all lie in the same plane. Snell’s law describes the relationship between the incident ray and the refracted ray. For a pair of two media, the ratio of the sine of the angle of incidence to the sine of the angle of refraction is always constant.